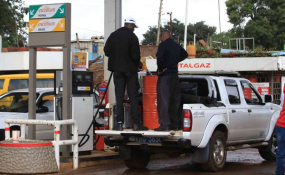 A customer fills a storage tank with diesel at a petrol station in Nyeri on September 6, 2018. Nairobi — Agriculture Cabinet Secretary Mwangi Kiunjuri has warned millers not to take advantage of the 16 per cent VAT on fuel to increase the price of flour. Addressing journalists on Tuesday, Kiunjuri said the increased fuel levy doesn't have adverse effects on millers therefore Kenyans shouldn't be charged more. "The increment in the 16 per cent VAT on fuel really doesn't have any adverse effects when it comes to milling and people should not take advantage of situations therefore there should be no change in pricing," said Kiunjuri. His stand came despite the Cereal Millers Association warning that the increase in fuel prices would directly affect the price of wheat and maize flour due to higher transportation costs. Kiunjuri also projected an increase of maize harvest this season compared to the last season attributing it to the good weather that has been witnessed during the season. He said this season 46 million bags of maize will be harvested compared to 40 million bags harvested last season.